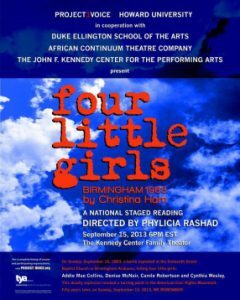 Presented at the Kennedy Center on the 50th anniversary of the bombing that inspired the play, FOUR LITTLE GIRLS was directed by Phylicia Rashad (first African American woman to win a Tony Award for Best Performance by a Leading Actress). Featuring students from the Duke Ellington School of the Arts and Howard University, with music composed by Kathryn Bostic, it was viewed in 47 states and live-streamed around the world. A special presentation in Birmingham, Alabama was preceded by a conversation between former Secretary of State Condolezza Rice and then Attorney General Eric Holder.